Objectives Despite the therapeutic value of current rheumatoid arthritis (RA) treatments, agents with alternative modes of action are required. Mavrilimumab, a fully human monoclonal antibody targeting the granulocyte–macrophage colony-stimulating factor receptor-α, was evaluated in patients with moderate-to-severe RA. Methods In a phase IIb study (NCT01706926), patients with inadequate response to ≥1 synthetic disease-modifying antirheumatic drug(s), Disease Activity Score 28 (DAS28)−C reactive protein (CRP)/erythrocyte sedimentation rate ≥3.2, ≥4 swollen joints despite methotrexate (MTX) were randomised 1:1:1:1 to subcutaneous mavrilimumab (150, 100, 30 mg), or placebo every other week (eow), plus MTX for 24 weeks. Coprimary outcomes were DAS28−CRP change from baseline to week 12 and American College of Rheumatology (ACR) 20 response rate (week 24). Results 326 patients were randomised (150 mg, n=79; 100 mg, n=85; 30 mg, n=81; placebo, n=81); 305 completed the study (September 2012–June 2013). Mavrilimumab treatment significantly reduced DAS28−CRP scores from baseline compared with placebo (change from baseline (SE); 150 mg: −1.90 (0.14), 100 mg: −1.64 (0.13), 30 mg: −1.37 (0.14), placebo: −0.68 (0.14); p<0.001; all dosages compared with placebo). Significantly more mavrilimumab-treated patients achieved ACR20 compared with placebo (week 24: 73.4%, 61.2%, 50.6% vs 24.7%, respectively (p<0.001)). Adverse events were reported in 43 (54.4%), 36 (42.4%), 41 (50.6%) and 38 (46.9%) patients in the mavrilimumab 150, 100, 30 mg eow and placebo groups, respectively. No treatment-related safety signals were identified. Conclusions Mavrilimumab significantly decreased RA disease activity, with clinically meaningful responses observed 1 week after treatment initiation, representing a novel mechanism of action with persuasive therapeutic potential. Trial registration number NCT01706926; results. Biological therapies have improved disease control and patient outcomes in rheumatoid arthritis (RA). However, approximately 50% of patients do not achieve low disease activity criteria within 12 months of antitumour necrosis factor-α treatment,1 while approximately 80% of patients do not achieve Disease Activity Score 28 (DAS28)−erythrocyte sedimentation rate (ESR)<2.6.2 It is possible that biologics targeting novel signalling pathways may prove beneficial in RA, including in these patients. Mavrilimumab, a fully human monoclonal antibody which blocks the GM−CSF receptor, is the first biologic in clinical development to target this pathway. 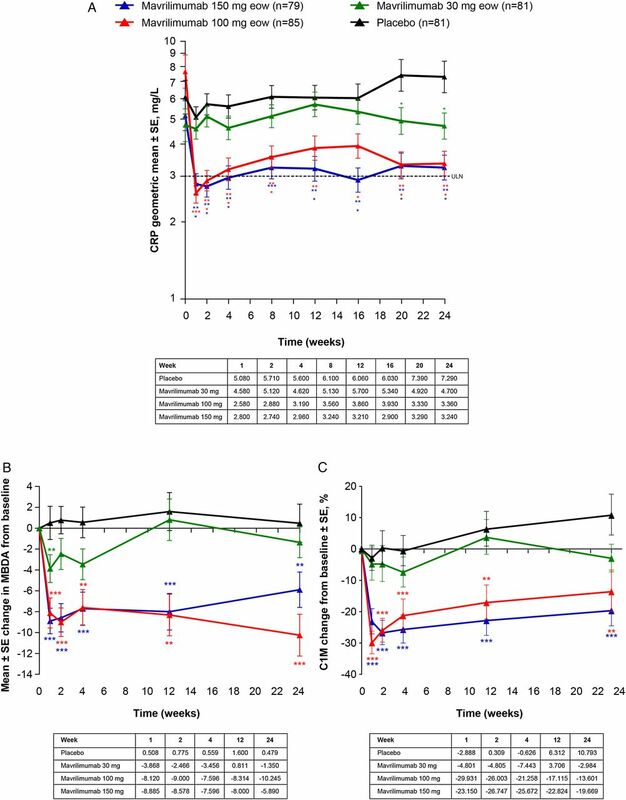 Clinical studies demonstrated the pharmacokinetics, pharmacodynamics and safety/tolerability of mavrilimumab, and provided evidence of efficacy.16–20 In this longer 24-week phase IIb study, we evaluated the therapeutic potential of GM−CSF antagonism in patients with moderate-to-severe, adult-onset RA by comparing the efficacy and safety/tolerability of subcutaneous mavrilimumab, at dosages of up to 150 mg every other week (eow) plus methotrexate (MTX), with that of placebo. This phase IIb, randomised, double-blind, parallel-group, placebo-controlled study (EARTH EXPLORER 1; NCT01706926) was conducted in 48 specialist sites (14 countries; Europe, South America, South Africa) (see online supplementary table S1). Population pharmacokinetic efficacy modelling and stochastic clinical trial simulations facilitated selection of the optimal dose range for the study. The study was conducted in accordance with the principles of the Declaration of Helsinki and the International Conference on Harmonisation Guidance for Good Clinical Practice and approved by appropriate institutional review boards or independent ethics committees at each site. Patients were 18–80 years with moderate-to-severe, adult-onset RA,23 DAS28−C reactive protein (CRP) ≥3.2 at screening and DAS28−ESR ≥3.2 at day 1,24 and ≥4 swollen joints at screening and day 1, and were receiving stable dosages of MTX (7.5–25.0 mg/week). Patients were required to have received treatment with ≥1 traditional disease-modifying antirheumatic drug (DMARD) prior to screening. Previous treatment with any biological DMARD discontinued because of lack of efficacy; recent treatment with any investigational drug, alkylating agents or parenteral steroids; and concurrent treatment with DMARDs other than MTX were not permitted. Changes in background RA treatment were not allowed for the first 12 weeks of the study, other than for safety reasons. Patients with clinically uncontrolled respiratory disease, active infection or high infection risk, and active or untreated latent tuberculosis were excluded. All patients provided written informed consent and were enrolled by the investigator or qualified designee. Study-stopping criteria are listed in the online supplementary material. Patients were randomised (interactive web response system) 1:1:1:1 to 150, 100 or 30 mg subcutaneous mavrilimumab or placebo eow in combination with stable dosages of MTX (7.5–25.0 mg/week) for 24 weeks, followed by transfer to a long-term, open-label extension (OLE) (NCT01712399) or a 12-week safety follow-up period. Study patients, investigators and sponsors were blinded to study treatment (see online supplementary material). During the 24-week treatment period, there were 14 scheduled visits (weeks 0, 1, 2 and eow until week 24). The safety follow-up period included visits at 4, 8 and 12 weeks after the last dose. Twelve weeks after treatment initiation, patients without adequate response (<20% improvement in both swollen and tender joint counts vs day 1) were eligible for early OLE entry. Corticosteroids (≤7.5 mg/day prednisolone or equivalent), analgesics and non-steroidal anti-inflammatory drugs were maintained at stable dosages for the study duration. Coprimary end points were change from baseline in DAS28−CRP score (week 12) and American College of Rheumatology (ACR) 20 (20% improvement in ACR criteria) response (week 24). Assessments performed are included in the online supplementary material. Secondary efficacy end points included: DAS28−CRP European League Against Rheumatism (EULAR) response rates, DAS28−CRP-defined remission (<2.6) and low disease activity (<3.2), ACR20/50/70 response rates at weeks 12 and 24, change from baseline or geometric means for ACR and DAS28 components over time and DAS28−ESR response. Assessments were performed at weeks 0, 1, 2, 4, 8, 12, 16, 20 and 24. CRP and ESR geometric means were measured over time. Exploratory end points, including disease activity and structural damage biomarkers, were examined at weeks 0, 1, 2, 4, 12 and 24. Multibiomarker disease activity (MBDA) Vectra DA score (Crescendo Biosciences, South San Francisco, California, USA)25 was calculated to track the effects of mavrilimumab on inflammatory biomarkers at predefined time points. Adverse events (AEs) and serious adverse events (SAEs) were summarised by severity and relationship to study drug by investigators. Laboratory evaluations (serum chemistry, haematology, urinalysis), vital signs, pulmonary function tests (PFTs), dyspnoea score and oxygen saturation were summarised by treatment group and time point. Serum was tested for antidrug antibodies (ADAs) and mavrilimumab concentrations throughout the study. Safety assessments were performed at every visit during the treatment period. PFTs (forced vital capacity, forced expiratory volume in 1 and 6 s) were performed at screening, and at weeks 12 and 24. Dyspnoea score and oxygen saturation were assessed at each visit using the modified Borg scale and pulse oximetry, respectively. Adjudication of lung function abnormalities and pulmonary AEs was by an Independent Pulmonary Expert Committee. The primary efficacy population was the modified intention-to-treat population (all randomised patients who received any study drug). The safety population included all patients who received study drug and had safety data available. A sample size of 70 patients per treatment group provided 80% power to achieve statistical significance for DAS28−CRP and ACR20 at a two-sided significance level of 0.05. This assumed a 0.6-unit difference in change from baseline and a SD of 1.25 for DAS28−CRP, and a 25% difference in ACR20 response rate with a placebo response rate of 40%. Change from baseline in DAS28−CRP was analysed using a mixed model for repeated measures (MMRM), with covariates for baseline DAS28−CRP, visit, treatment and visit-by-treatment interaction. Dosage–response assessment was performed using a test for linear trend on DAS28−CRP change from baseline at week 12. Two sensitivity analyses were performed for change from baseline DAS28−CRP to allow for patients withdrawing from treatment (see online supplementary material). ACR20/50/70 response rates, DAS28-defined remission (<2.6) and response rates at each visit were analysed using logistic regression, with results presented as differences in response rates (95% CI; p value).28 Individual ACR components were analysed using the same method as for DAS28−CRP analyses. DAS28−CRP EULAR responses at each time point were analysed via a proportional odds model, with treatment as a factor. CRP and ESR were log-transformed prior to analysis. For discrete responder outcomes, patients who withdrew from treatment for any reason (including entering the OLE), started any new RA medication, or increased MTX dosage, were imputed as non-responders for all subsequent assessments. For continuous outcomes (DAS28−CRP and ACR components), missing data were handled by the MMRM analysis (including patients entering the OLE). For MBDA and C1M, results for each time point were analysed versus placebo using a non-parametric Mann-Whitney U test. AE and other safety data were summarised with descriptive statistics. An external independent safety data monitoring board oversaw the study. Patients were recruited between September 2012 and June 2013, with evaluation until January 2014. Of 326 patients randomised, 305 (93.6%) completed the study. Patient disposition is presented in figure 1. Demographics and baseline clinical characteristics were similar between treatment groups, and indicated a cohort of patients with predominantly severe disease (DAS28−CRP >5.1) that would qualify for first-line biological therapy (see table 1 and online supplementary table S2). CONSORT diagram (A) and time to randomised study exit (B). Randomised study exit includes patients who withdrew from study treatment, patients who entered the OLE from week 12 as permitted in the protocol and those patients who entered the safety follow-up period at week 24. At week 12, 3 (3.8%), 8 (9.4%), 12 (14.8%) and 37 (45.7%) patients transferred to the OLE study because of lack of efficacy in the mavrilimumab 150, 100 and 30 mg groups and placebo group, respectively. eow, every other week; OLE, open-label extension. Mavrilimumab significantly reduced DAS28−CRP scores from baseline compared with placebo at week 12, meeting the coprimary outcome (change from baseline (difference from placebo (95% CI)) 150 mg: −1.90 (−1.22 (−1.60 to −0.84)), 100 mg: −1.64 (−0.96 (−1.33 to −0.58)), 30 mg: −1.37 (−0.69 (−1.06 to −0.31)), placebo: −0.68; p<0.001, all dosages; figure 2A). Differences from placebo were detected at week 1, with treatment benefit increasing through week 12 (figure 2A). At week 24, significantly more patients receiving mavrilimumab 150 mg eow achieved an ACR20 response compared with placebo, with a dosage-dependent response (150 mg: 73.4%; 100 mg: 61.2%; 30 mg: 50.6%; placebo: 24.7% (p<0.001); figure 2B), indicating that the study also met its second coprimary outcome. There were significantly more ACR20 responders in the mavrilimumab 150 mg eow group than in the placebo group from the first assessment (week 1) and at every other assessment through to week 24 (figure 2B). Subgroup analyses of ACR20 by CRP concentration (normal or greater than the upper limit of normal), the presence of rheumatoid factor and/or anticitrullinated protein antibody (ACPA), and prior use of biologics and smoking status (see online supplementary table S3) suggest that clinical response is not dependent on baseline disease characteristics. Furthermore, mavrilimumab was demonstrated to be efficacious in patients who were rheumatoid factor negative and ACPA-negative at baseline (n=59; 18.1%). Changes from baseline in DAS28−CRP score (A), ACR20 response (B) and changes from baseline in patient assessment of pain (C) by visit. *p<0.05, **p<0.01, ***p<0.001 mavrilimumab versus placebo. ACR, American College of Rheumatology; DAS28−CRP, Disease Activity Score 28–C reactive protein; eow, every other week; SE, standard error. DAS28−CRP/ESR EULAR good and moderate responses occurred more frequently with mavrilimumab 150, 100 and 30 mg eow than placebo at weeks 12 and 24 (figure 3). This was also true for ACR20 and ACR50 response rates (ACR50 response at week 24: 40.5%, 25.9%, 28.4% and 12.3%, respectively; p<0.05, all dosages; figure 3). Mavrilimumab 150 mg eow significantly improved ACR70 response rates compared with placebo at weeks 12 and 24 (week 12: 10.1% vs 1.2% (p=0.017); week 24: 13.9% vs 3.7% (p=0.026); figure 3). At week 24, there was a significantly greater ACRn response for patients receiving mavrilimumab compared with placebo (figure 3). Rates of DAS28−CRP remission (<2.6) were also significantly greater with mavrilimumab 150 mg compared with placebo at week 12 and all dosages of mavrilimumab compared with placebo at week 24 (p<0.05, all dosages; figure 3). There were significantly more patients with DAS28−CRP low disease activity scores (<3.2) in the mavrilimumab 150 mg eow group compared with placebo at weeks 12, 16, 20, 24 (31.6%, 40.5%, 43.0%, 41.8% vs 12.3%, 14.8%, 14.8%, 8.6%, respectively) and in all mavrilimumab groups compared with placebo at week 24 (p<0.001; figure 3). To confirm the robustness of the data, analyses of change from baseline in DAS28−ESR were also performed, and results were similar to those using DAS28−CRP (see online supplementary figure S1). Analysis of secondary efficacy outcomes: ACR response rates (A), ACRn response over time (B), DAS28−CRP low disease activity responders (DAS28−CRP <3.2) (C), DAS28−CRP remission (DAS28−CRP <2.6) over time (D), DAS28−CRP European League Against Rheumatism (EULAR) response (E), DAS28−ESR EULAR response (F). ACR/EULAR response criteria are detailed in online supplementary table S6. DAS28−CRP remission defined as DAS28−CRP <2.6. DAS28−CRP low disease activity defined as DAS28−CRP <3.2. ACR, American College of Rheumatology; DAS28−CRP, Disease Activity Score 28–C reactive protein; ESR, erythrocyte sedimentation rate; eow, every other week; SE, standard error. Results for components of composite outcomes were similar. Greater changes from baseline in ACR and DAS28 components, and patient-reported outcomes compared with placebo were observed at weeks 12 and 24 for patients receiving mavrilimumab 150 mg eow (see online supplementary table S4). As a greater number of patients in the placebo group than in the mavrilimumab group transferred to the OLE study between weeks 12 and 24 because of lack of response under ‘rescue’ criteria, it is important to interpret the week 24 data with caution. A dosage-dependent, rapid (week 1) and sustained (week 24) reduction of both CRP and ESR concentrations was also observed, with CRP levels plateauing at approximately 3.3 mg/L (see figure 4A and online supplementary figure S2, respectively). Adjusted geometric mean ratio to baseline in CRP concentrations (A), change from baseline in MBDA score (B) and C1M (C). *p<0.05, **p<0.01, ***p<0.001 mavrilimumab versus placebo. For MBDA analyses (graph A), the number of patients for whom serum samples were analysed at each time point ranged from 57 to 64, 53 to 60, 53 to 61 and 40 to 59 for mavrilimumab 150, 100, 30 mg eow and placebo, respectively. For C1M analyses (graph B), the number of patients for whom serum samples were analysed at each time point ranged from 73 to 76, 74 to 84, 62 to 78 and 54 to 77 for mavrilimumab 150, 100, 30 mg eow and placebo, respectively. CRP, C reactive protein; eow, every other week; MBDA, multibiomarker disease activity; SE, standard error; ULN, upper limit of normal. Of 326 patients, 120 reported at least one AE (150 mg: 43 (54.4%); 100 mg: 36 (42.4%); 30 mg: 41 (50.6%); placebo: 38 (46.9%)). The most common treatment-emergent AEs (TEAEs), and those leading to discontinuation or interruption of the study drug, are provided in table 2. SAEs were reported for two (2.5%), five (5.9%), four (4.9%) and one (1.2%) patients in the mavrilimumab 150, 100, 30 mg eow and placebo groups, respectively (table 2). Of these, only pneumonia (mavrilimumab 30 mg eow) and angioedema (mavrilimumab 150 mg eow) were considered to be related to treatment by the investigator. Rates of pulmonary AEs for mavrilimumab 150, 100 or 30 mg eow were similar to the rate for placebo (6.3%, 3.5%, 6.2% vs 9.9%, respectively). There were no deaths or anaphylaxis. Two hypersensitivity AEs led to discontinuation (angioedema 6 days after first dose, mavrilimumab 150 mg eow; drug hypersensitivity 1 day after first dose, mavrilimumab 30 mg eow). No clinically meaningful differences between mavrilimumab-treated and placebo-treated patients in haematology, including neutrophils, serum chemistry and urinalysis parameters, were observed. ADAs were detected in 0 (0.0%), 3 (3.5%), 13 (16.0%) and 2 (2.5%) patients in the mavrilimumab 150, 100, 30 mg eow and placebo groups, respectively (see online supplementary material). One injection-site reaction was observed (mavrilimumab 150 mg eow). Pulmonary function values, dyspnoea scores and oxygen saturation were generally similar between mavrilimumab-treated and placebo-treated patients, with no evidence of a dosage-dependent decline in the mean values for patients receiving mavrilimumab (see online supplementary table S5). Any threshold changes in the percentage of PFT values were generally transient. In biomarker analyses, treatment with mavrilimumab 150 and 100 mg eow induced early (week 1) and sustained (week 24) significant reductions in MBDA score versus placebo (p<0.01; figure 4B). Significant decreases from baseline in C1M concentrations were also observed for patients receiving mavrilimumab 150 and 100 mg eow compared with placebo from week 1 to week 24 (p<0.01; figure 4C). 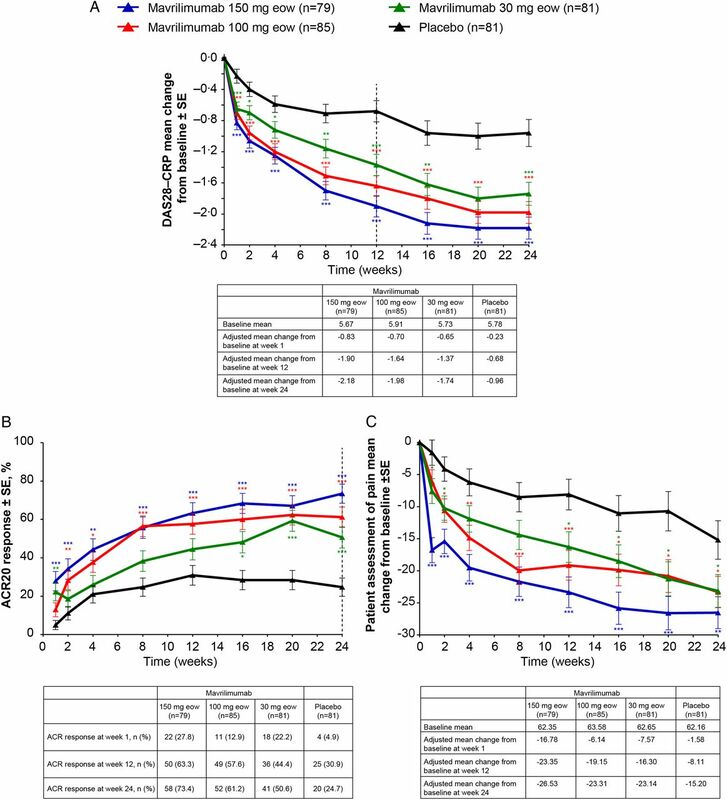 A rapid and sustained clinical response to mavrilimumab 150 and 100 mg eow was reflected in the reduction of CRP and ESR, concurrent decreases in MBDA score, a composite of soluble disease activity biomarkers and C1M concentration.27 A clear dosage–response relationship was observed for mavrilimumab-treated patients in most efficacy outcomes analysed and for biomarker analyses, but not in AE rates or other safety parameters. However, as the study was powered specifically to assess the coprimary end points, the sample size and study duration were not sufficient to assess joint damage progression. The number of patients who transferred to the OLE between weeks 12 and 24 because of lack of response was low in the mavrilimumab 150, 100 and 30 mg eow groups compared with placebo (3 (3.8%), 8 (9.4%), 12 (14.8%) and 37 (45.7%), respectively). This could be seen as an indication of the benefit of mavrilimumab treatment; however, it is a limitation of the study analysis, as the response of these patients at week 24, had they remained in the study, is unknown. To account for patients transferring to the OLE, a non-responder imputation for the ACR outcomes and a sensitivity analysis for DAS28−CRP were performed. The primary analysis method of MMRM resulted in a smaller difference from placebo than both the Last Observation Carried Forward (LOCF) and the Baseline Observation Carried Forward (BOCF) method (DAS28−CRP week 24 mavrilimumab 150 mg eow difference from placebo: MMRM=−1.21; LOCF=−1.46; BOCF=−1.37). No substantial increase in pulmonary events, or apparent dosage–response changes in pulmonary function, dyspnoea score or oxygen saturation, was noted for mavrilimumab-treated patients compared with those receiving placebo. Furthermore, mavrilimumab treatment was not associated with any confirmed or suspected case of PAP, as verified by an Independent Pulmonary Expert Committee. An open-label, phase II safety study (NCT01712399) aims to establish the long-term safety and efficacy profile of mavrilimumab 100 mg in patients with RA. Despite the success of the currently available biologics in RA, a considerable percentage of patients do not achieve long-term responses to these therapies.33 Consequently, new treatments employing different mechanisms of action from those currently available, such as GM−CSFR antagonism, are needed. Data from this study demonstrate that mavrilimumab, particularly at a dosage of 150 mg eow, provides a rapid, effective and well-tolerated potential treatment for patients with RA. 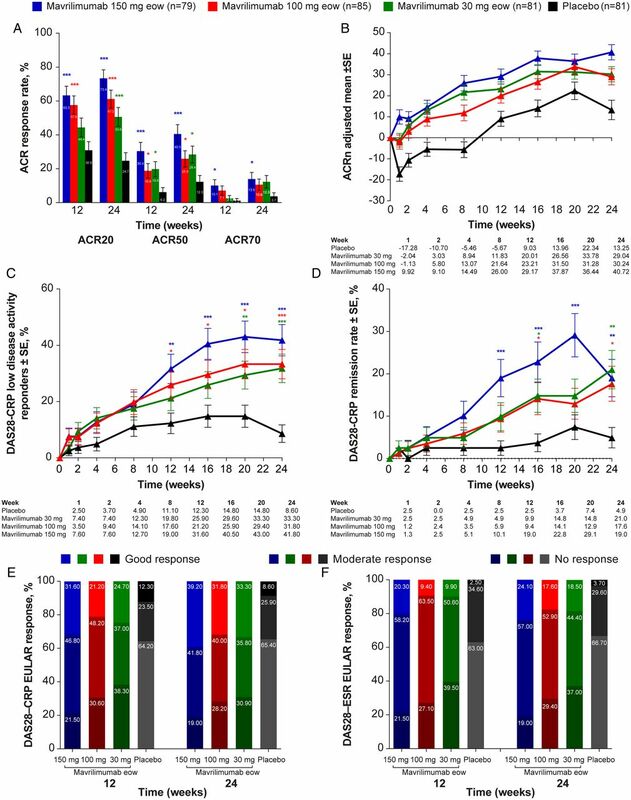 Moreover, blockade of GM−CSF signalling could be applicable to patients for whom treatment with biologics targeting other pathways has failed or to those with other inflammatory/autoimmune diseases.33 This proof-of-concept study confirms that inhibition of GM−CSF activity is a promising and novel therapeutic approach for patients with RA, including those who do not adequately respond to currently available therapies. The authors would like to thank Crescendo Biosciences, Inc. and Nordic Bioscience for the MBDA and C1M analyses, respectively. The authors would also like to thank the study investigators, patients and the AstraZeneca/MedImmune study group. The study was funded by AstraZeneca/MedImmune. Editorial assistance was provided in the development and revision of the manuscript by Michael A Nissen, ELS, of AstraZeneca. Marius Albulescu, MD, of MedImmune, contributed to study design, analysis and interpretation of data. Medical writing support was provided by Niki Panagiotaki, PhD and Katie Alexander, PhD, QXV Comms (an Ashfield business, part of UDG Healthcare plc), Macclesfield, UK, which was fully funded by MedImmune. Matthew A Sleeman is a former employee of MedImmune; his current affiliation is Regeneron Pharmaceuticals, Inc., Tarrytown, NY.
. [Plasma GM-CSF concentrations in rheumatoid arthritis, systemic lupus erythematosus and spondyloarthropathy]. Z Rheumatol 1992;51:121–6.
. Efficacy and safety of mavrilimumab in Japanese subjects with rheumatoid arthritis: Findings from a Phase IIa study. Mod Rheumatol 2015;25:21–30.
. Results of a comprehensive review of pulmonary function and safety data in a phase IIb clinical program testing anti-GM-CSF receptor antagonist mavrilimumab for treatment of RA. Arthritis Rheum 2016;68(Suppl 10):3581–4.
. 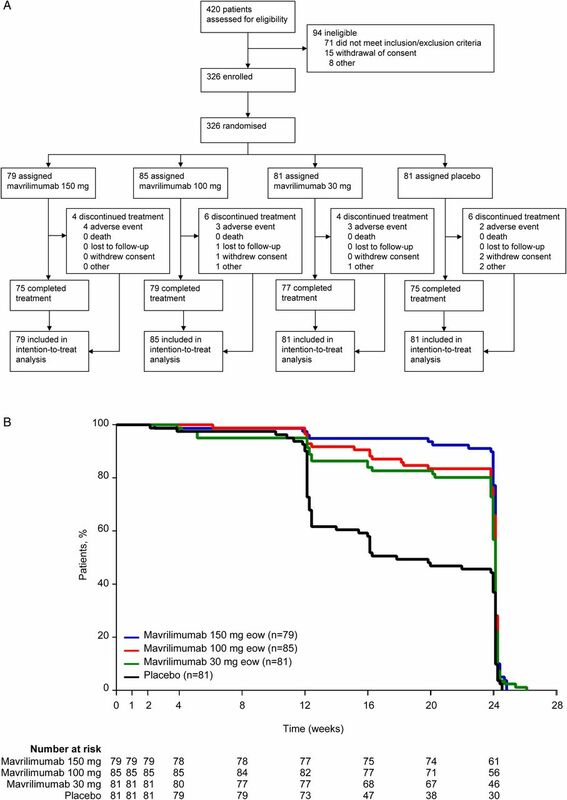 Analysis of patient-reported outcomes during treatment with mavrilimumab, a human monoclonal antibody targeting GM-CSFRá, in the randomized phase 2b EARTH EXPLORER 1 study. Abstract presented at the American College of Rheumatology (ACR) annual meeting; 2014. http://acrabstracts org/abstracts/analysis-of-patient-reported-outcomes-during-treatment-with-mavrilimumab-a-human-monoclonal-antibody-targeting-gm-csfra-in-the-randomized-phase-2b-earth-explorer-1-study/2014 http://acrabstracts.org/abstracts/analysis-of-patient-reported-outcomes-during-treatment-with-mavrilimumab-a-human-monoclonal-antibody-targeting-gm-csfra-in-the-randomized-phase-2b-earth-explorer-1-study/ (accessed 11 Jun 2014). GRB and IBM contributed equally. DC and MEW are joint senior authors. Contributors GRB contributed to the study design, interpretation and generation of data, manuscript preparation and review; IBM contributed to study design, interpretation, manuscript preparation and review; JK contributed to study design, data analysis and interpretation, and manuscript preparation and review; PM contributed to data collection, review and interpretation; MK contributed to data collection and manuscript review; JV contributed to study design, data collection, analysis and interpretation, and manuscript preparation and review; AR-R contributed to study design, interpretation of data, manuscript preparation and review; EM contributed to protocol assessment, data analysis and interpretation, and manuscript preparation and review; MAS contributed to study design, data analysis and interpretation and manuscript preparation and review; AG contributed to study design and set-up, data cleaning, analysis and interpretation, and manuscript preparation and review; DS contributed to study design, data cleaning, analysis and interpretation, and manuscript preparation and review; XG contributed to data collection, analysis and interpretation, and manuscript preparation and review; WIW contributed to study design, data analysis and interpretation, and manuscript preparation and review; BW contributed to study design, data analysis and interpretation, and manuscript preparation and review; C-YW contributed to study design, data collection, and manuscript preparation and review; PCR contributed to study design, data collection, analysis and interpretation, and manuscript preparation and review; DC contributed to study design and conduct, data analysis and interpretation, and manuscript preparation and review; MEW contributed to study design and set-up, data analysis and interpretation, and manuscript preparation and review. Funding The study was funded by AstraZeneca/MedImmune. Competing interests GRB is a consultant and has received lecture fees from Abbvie, Bristol-Myers Squibb, MSD, Pfizer, Roche, UCB; IM has received grants and personal fees from Abbvie, AstraZeneca, Bristol-Myers Squibb, Janssen, MedImmune, MSD, Pfizer, UCB; JK is a shareholder and employee of Corrona; has received grants from Abbvie, Amgen, Genentech, Lilly, Pfizer; and is a consultant for Abbvie, Amgen Genentech, Lilly, Pfizer, BMS and MedImmune; PM has received grants from MedImmune; JV is a consultant for Biotest and Samsung Bioepics and has participated in speaker bureaus for Abbvie, MSD, Pfizer, UCB, Roche; AR-R received honoraria for consultation and lectures from Abbvie, Amgen, Chugai, Roche, UCB, MSD, Pfizer, Lilly, Sanofi, Novartis, BMS; EM has received a grant from Organizicion medica de Investigacion; MAS was formerly a full-time employee of MedImmune, a wholly owned subsidiary of AstraZeneca; AG, DS, XG, WIW, BW, C-YW, PCR and DC are employees of MedImmune and hold AstraZeneca shares; MEW has received research grants from Bristol-Myers Squibb, Crescendo Bioscience and UCB, and is a consultant for Abbvie, Amgen, AstraZeneca, Bristol-Myers Squibb, Corrona, Crescendo Bioscience, Genentech/Roche, Janssen, Lycera, Lilly, MedImmune, Merck, Pfizer, Regeneron, Sanofi, UCB. Ethics approval Institutional Review Board/Independent Ethics Committee.